Welcome to the Newburgh History Society. Scotland. Come and visit the Laing building, open on Sunday and Wednesday afternoons until 4pm, for fascinating exhibitions on Newburgh's past and local family history information. Newburgh Ancestry & History Society will be having a fund-raising coffee morning at Newburgh Tayside Institute Community Centre on Saturday 6th April 2019. This will include the usual stalls, refreshments and raffles. Donations can be handed in at the Lower Laing Building in advance or at the door on the morning. Friends of the Laing support Laing building use reflecting Alexander Laing's bequest to Newburgh people. To join, email friendsofthelaing@hotmail.com or ring 01337 840431. 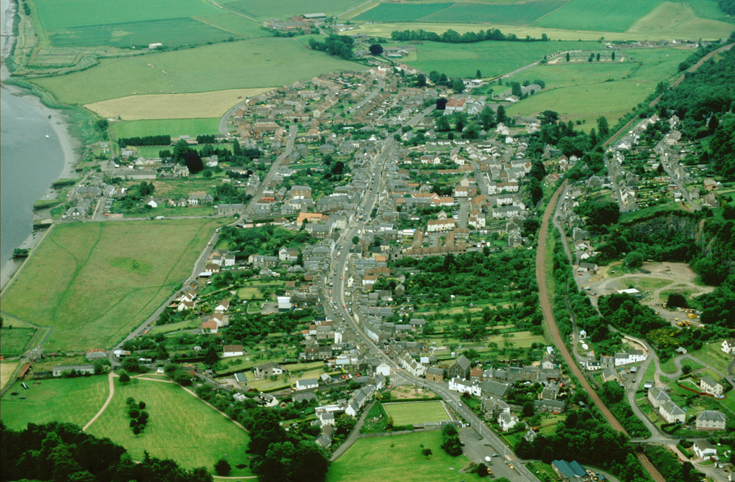 Picture: Newburgh from the air: the High Street 'lang riggs' preserve the layout of the medieval burgh.